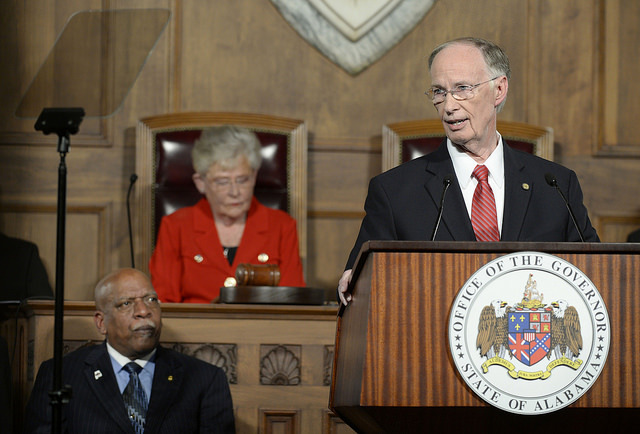 After nearly 22 months of assessment and planning by the Alabama Department of Corrections, Governor Robert Bentley announced in his State of the State address on February 7, 2017, a bold plan to transform the Alabama Prison System with a state-of-the-art, modern system that increases public safety through safe, secure, humane incarceration and effective, evidenced-based rehabilitation and re-entry services. Decades of underfunding have created a system where security concerns created by over-crowding and understaffing consume the majority of department resources at the expense of robust rehabilitation and reentry. The status quo is unsustainable. The department’s aged facilities require labor intensive security management operations to properly oversee offenders. In order to ensure a safe, secure and humane environment moving forward, the most cost effective long-term approach is to replace existing facilities with large state-of-the-art, operationally efficient regional prisons. Governor Bentley has proposed a three-faceted approach to overhaul the department: One, close Julia Tutwiler Prison for Women and build a new 1,200 bed women’s facility; Two, consolidate 13 of 15 close and medium security men’s facilities into three, new, 4,000-bed, state-of-the-art prisons and; Three, repurpose and renovate the remaining antiquated, facilities into Rehabilitation and Re-entry Centers focused on preparing inmates for release back into the community. The department proposes to build the new facilities in the northern, central, and southern regions of the State in proximity to current prison locations to reduce the impact to our existing workforce. The new facilities will operate at security staffing ratios close to 15:1, allowing the department to use current employees to fully staff new facilities providing effective and safe population management and freeing resources to invest in rehabilitation. In addition to security staffing efficiencies, large scale regional facilities allow for support and medical staff consolidations as well as the potential for on-site medical care facilities designed to reduce both security and transportation costs. Governor Bentley’s plan offers a new vision for Corrections in Alabama—a vision of increased public safety, reduced recidivism, state-of-the-art facilities, and improved rehabilitation and re-entry. The initiative will serve as a national model that other states can use to improve the effectiveness and efficiencies of its Department of Corrections.